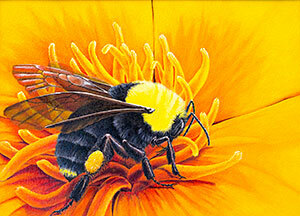 Medford artist Karin Wares took first in both the Habitat Conservation and People’s Choice contests. Photo by Bob Swingle, ODFW. Today the Oregon Department of Fish and Wildlife announced the winners of its 2019 Habitat Conservation, Upland Game Bird, and Waterfowl Stamp art contests. A panel of independent judges chose the winners November 3 at the ODFW art show and wine release event at Duck Pond Cellars in Dundee. 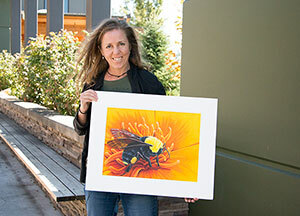 Habitat Conservation Stamp Winner – Karin Wares of Medford, Oregon with her painting of a Franklin’s Bumble Bee, an Oregon Conservation Strategy Species of greatest conservation need. 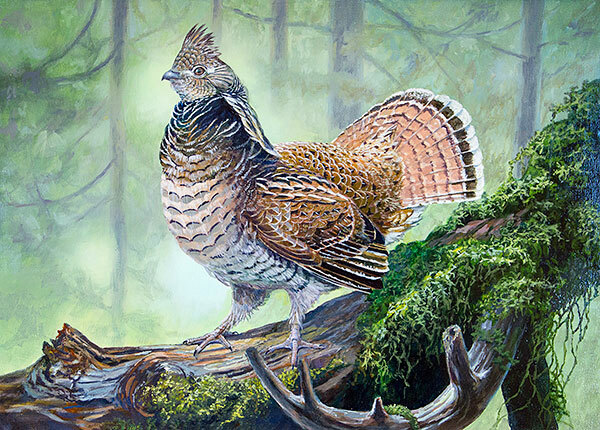 Upland Game Bird Stamp Winner – Kip Richmond of Clayton, North Carolina with his painting of a Ruffed Grouse. Waterfowl Stamp Winner – Guy Crittenden of Richmond, VA with his painting of a pair of Greater White-fronted Geese. Wares, Richmond, and Crittenden will each receive a prize award of $2,000. Winning artwork will be the face of the 2019 stamps and other promotional items to benefit Oregon’s native wildlife and their habitats. More than 300 people attended this year’s event and voted for their favorite artwork out of 70 entries for the People’s Choice Award. Competition for this award was stiff with Wares taking first place with her Franklin’s Bumble Bee painting. The art show was held at Duck Pond Cellars in conjunction with the release of their Conservation Cuvee – Lot 6. This is the sixth year the winery has produced unique blends of Pinot Noir that feature winning artwork from the Habitat Conservation Stamp art contest. Duck Pond then donates $5 from the sale of each bottle to ODFW’s Conservation Program. To date, the winery has donated $42,385 which is used to benefit species of greatest conservation need in Oregon. Conservation Cuvee – Lot 6 features the 2018 Habitat Conservation Stamp winning artwork of Pygmy Rabbit by Kip Richmond. Conservation Cuvee can be purchased.at the Duck Pond Cellars tasting room and through its Conservation Cuvee website. The Habitat Conservation Stamp and art prints feature species identified in the Oregon Conservation Strategy as species in need of help, such as Acorn Woodpeckers, Pygmy Rabbits, Northern Red-legged Frogs, Coho Salmon and many others. Revenue helps restore habitats essential to declining or at-risk species. Collector stamps and art prints are available for purchase on the ODFW website. Oregon’s upland game bird stamp art contest first began in 1990 and each year features one of 10 upland game bird species found in Oregon. This year, artists were asked to feature Ruffed Grouse in its natural habitat setting. Sales of the Upland Game Bird Stamp fund game bird research, surveys, habitat improvement and conservation projects. Sales of the Waterfowl Stamp fund waterfowl management projects including population surveys, banding, and wetland management and enhancement. Artwork featured on previous stamps included geese, ducks and waterfowl hunting dogs. Artists this year could feature Lesser Scaup, Greater White-fronted Geese, American Green-winged Teal or Red-breasted Merganser in their natural habitat. Hunters who purchased a waterfowl and/or upland validation can request a complementary stamp for the validation they purchased using the form found online.